The Sons of Norway has a 108 year tradition of providing the opportunity to learn and the encouragement to study your Norwegian heritage. Monthly programming is geared to enjoyment and learning of history, heritage and culture for the whole family. Parent and children will learn together about their Norwegian roots and continue the important work of passing from generation to generation their family heritage. The finest Norwegian language camp is held at Skogfjorden near Bemidji MN each summer for students age 8-18. 1,2&4 weeks camps immerse students in learning about Norway. Cultural activities, crafts, language, camps and other fun activities await. Get involved. The midday summer sun makes lace from aspen shade on the forest floor. Woodsmoke's fragrance floats into the circle of singers along with the scent of risengrynsgrot (rice porridge) simmering in a cast-iron kettle behind the immigrants' small cabins. Time melts. Norwegians, first-generation Norwegian Americans, and children of great-grandchildren of Norwegians join hands and sing. They move left with the music, acting out the norsk lyrics to a song about laundering clothes. Kids in sneakers hear not just the words, but also how to make cultural music that carries history into contemporary learning. Adults, who have helped small hands craft nisser for this "first Christmas" on North America's frontier, encourage the adventure. This is the scene at a summer camp in Minnesota. But it's no ordinary camp. Welcome to Skogfjorden (lake of the woods), the Norwegian village northeast of Bemidji that envelops young people into Norway's past, present, and future. Skogfjorden, which organizers refer to as a village instead of a camp, is a bright star in the renowned Concordia Language Villages' constellation of immersion programs. It also is an old friend to many Sons of Norway members. From torsk fundraising dinners at local lodges to a substantial buy-in with money and sweat equity to begin building the per­manent site in 1963, Sons of Norway has supported the village financially and has sent generations of young Norwegian-Americans to the splendid spot by Turtle River Lake in Northern Minnesota. In 1996-97, Sons of Norway contributed $37,400 to Skogfjorden in the form of scholarships. In fact, Sons of Norway consistently is the largest single donor to Concordia Language Villages, says Liv Dahl, SON Foundation admisistrative director and Heritage Programs manager. Why does the investment in Skogfjorden by those interested in Norway continue to pay off? Because Skogfjorden creates a Norwegian aesthetic. It provides an opportunity to step into Norwegian shoes to dance, sing, think, play, read, and work for a week, two weeks, or a month. It nurtures belonging in the larger world. One August morning last summer, a breeze lift­ed a song about Skogfjorden from counselor Asmund Svensson's guitar and from young voic­es. If anyone remains unenergized even after breakfast, Allsang (group singing) remedies that. Kids catch the giggles acting out a song about a princess. Skogfjorden dean 'rove Dahl, (who is also Liv Dahl's daughter), translates for a visitor. The kids need nothing more than the context and camaraderie to clap and tap their way through a lightning-fast half-hour of music. Singing at Skogfjorden also can reach others. Counselor Randi Buckley says evening pro­grams at lakeside often come with a bonus; when Skogfjorden villagers sing in Norwegian, other language villages on Turtle River Lake sometimes add Swedish, Finnish, French, or German songs to the night air. Norwegian is spoken everywhere at Skogfjorden. Along with pantomime, signs, and formal language instruction groups, it's a good bet that a child entering with a Norwegian vocabulary that stretches no further than a quaint "Uff-da" will leave two weeks later blurt­ing out sentences of modern Norwegian. Between' place-in between the exotic and the familiar. By working in between, we increase the spectrum of the familiar." Sessions last one week for young participants, two weeks for advanced and older children, a month for high-school credit courses. The language instruction is designed to to teach campers enough Norwegian to be able to function in Norway, Tove Dahl says. A first-year villager will learn language for basic survival skills. A second-year speaker will learn geography and build language skills. There are lessons for 10 years of study. Skogfjorden's "sister" program, Camp Norway, offers "grad school." equally as important as immersion learning, in making the institution click for kids. Nelson, who took the name "Peter" last year for village life, highly recommends the honey wheat bread (which we've made at home, too) the smoked salmon he tried there. Skogfjorden is designed to affirm heritage of Norwegian Americans Norwegian Canadians and to expand the value of culture and language by encouraging ties to Norway today, Tove Dahl says. Toward that end, a lesson in the immigrant program at camp, called Fagertun, might expand on teachings about frontier Christmas activities with a discussion of what it means to be an immigrant. Villagers might be asked to consider how immigrants coming to Norway today might face chal­lenges similar to those confronted by the Norwegian immigrants who built the very log cabins at Skogfjorden. The students learn how immigrants assimilate into other cultures while safeguarding their heritage. Fagertun is one of four cultural programs in Skogfjorden's core curriculum. So is the time­travel simulation of Midtgard, named for the mythological Viking realm between the world of the gods and the world of men. In Midtgard, a grassy glen near Skogfjorden's entrance, woodcarvers might be working in the Viking-era surroundings, seated between a real stabbur (traditional Norwegian store­house) and a replica of a stavkirke (traditional Norwegian wooden church). This is a place of imagination and even romance. Staff counselor Randi Buckley tells how she was married on Midtgard's lawn. She says Skogflorden has been a special home for her, a constant for a young person raised in a military family that moved frequently. Hence, Skogfjorden was a logical choice for the six-year villager and eight-year staffer as the site of her wedding to a fellow counselor. A third core program teaches about modern living in Norway. Last year's program at Soltun was school time, and it included, among many es, a physical education program similar to those typical for middle-school students in Norway. The fourth core program, called Jotunheiinen, focused on science and outdoor living by taking advantage of Skogfjorden's natural surroundings. Through those cultural programs, villagers experience both Norway's past and present. The combination clicks with villagers. Between 60 and 70 percent return to Skogfjorden after their first session. Most students come from a Norwegian family background; "Norge" shirts and blond hair are right at home. Each day at Skogfjorden begins with a flag raising. Kristen Johnson of Shoreview, Minnesota, admits she first attended Skogfjorden in 1981 to please her grandmother. Now, she has attended for 16 years. Johnson answered to her village name "Eva" when kids gathered by the beach on a perfect, cloudless summer morning last year. Johnson, a graduate of Augsburg College in Minneapolis and a Skogfjorden counselor now, says her experience is fairly typical. Kids come to Skogfjorden because a grandparent or parent wants them to get a taste of their Norwegian heritage. Then the kids learn that, by golly, village life is fun. Even Tove Dahl admits she had to be coaxed to attend the village her first year when she was apprehensive about a new experience away from home. Her concerns vanished within min­utes of meeting other girls in her cabin, and her 26-year adventure had begun. Skogfjorden remains an adventure for young villagers of the '90s. For instance, Sigrid Espe of Woodbury, Minnesota, told members of Vonheim lodge 1-108 in­ Minneapolis at a December gathering "I enjoyed myself very much [last summer at Skogfjorden]. We would raise the flag and sing the national, anthem. The meals were just delicious. We would sit by the fire at night or go for hikes." How Do You Spell "Summer Fun"
Have you ever wanted to learn to speak Norwegian? Do you enjoy spending time outdoors? Would you like to make some new friends who share your love of Norwegian heritage? If so, a Sons of Norway summer camp may be just the place for you. For many kids-and adults-summer means a welcome visit to one of the nine camps that Sons of Norway operates in the United States, Canada, and Norway. "Don't think it's boring and just about learning language-there are all kinds of fun things to do," says 14-year-old Tabitha Morecombe of Surrey, British Colombia. She and her brother Taylor have attended district 2's Camp Normanna near Seattle for a total of five years between the two of them. With an outdoor swimming pool, tennis court, and "trees everywhere and mountains all around," who wouldn't love the program? The activities at the two-week camp, including playing Capture the Flag, learning to bake krumkaker, and exploring nature, are nonstop. Guest speaker Roger Smith shares some old Viking tales with campers at Camp Nidaros in seaside, Oregon. 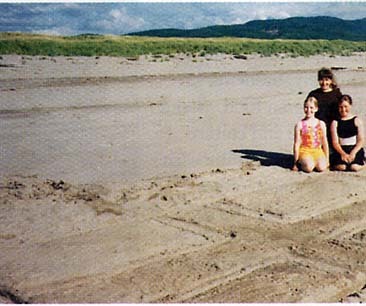 The Norwegian flag takes form during a sand-sculpting contest at Camp Nidaros. Action-packed programs are available at all of the camps, which are located from coast to coast in the United States; in Alberta, Canada; and in Skogn, Norway. (See related story about Skogfjorden, the Concordia Language Village Camp in Bemidji, Minnesota, on p. 11.) Independently operated by the SON districts in which they're located, the camps receive camper scholarship support from local lodges. The camps typically combine out-door recreational opportunities with a multitude of Norwegian heritage activities. "All the camps work to have a language component and Norwegian: crafts and culture," explains Tanya Gullicks, Sons of Norway's public relations and heritage specialist. A converted dude ranch serves as d trict 3's youth camp, which is part i the district's "Land of the Vikings" property. Located on the scenic northern edge of the Catskills in Sherman, Pennsylvania, the Third District Youth Camp's amenities include a private bath for every too a large dining hall ("with great foo( says district 3 youth director Judy Mack), and a pool. Campers can canoe on the West Branch River. Mornings at the camp are devote to basic es in conversational Norwegian. Everyone learns the national anthem and the table prayer, and they can choose between es on a variety of Norwegian crafts such as rosemaling, woodcrafts, and traditional Hardanger embroidery. Archery also is offered. Afternoons, the woods and fields are filled with the excited voices of kids swimming, hiking, orienteering, or playing soccer and basketball. In the evenings, the Norwegian theme continues with folk dancing, talent shows, or stories of Viking history told next to a roaring bonfire. "The kids form some really firm friendships," Mack says. "Many of the campers come for as many years as they can and even want to continue after age 15." But new campers are encouraged to give the experience a try; plenty of newcomers attend each year. The district 3 camp, which has been operating for more than 20 years, averages 40 kids per session. One of the week-long sessions is devoted to kids ages 12 to 15. The other is for 8- to 11-year-olds. Lots of Fun District 5's Camp Masse Moro (lots of fun), a rustic camp situated beside the beautiful Eau Claire River in Wisconsin, will celebrate its 20th year this summer, and plans for a camper and staff reunion are in the works. The camp, which accommodate-dates about 65 campers, offers a two-week overnight program for 9- to 15-year-olds. There's also a special five-day retreat for adults. Most camps serve only those members residing in their district, but Masse Moro goes out of its way to include campers from other districts. Last year, for example, six campers from district 1 attended. The camp originally focused on Norwegian language instruction and Viking lore but has broadened its emphasis to include all aspects of Norwegian heritage, says Connie Rew, the district 5 youth director. Still, kids are encouraged to speak Norwegian as much as possible. "When they get here, they're given a Norwegian passport and a Norwegian name," she says. "They make a name badge to wear so every-one knows their new name." ABOVE: Lunchtime with traditional cuisne helps campers at Camp Norge get a better sense of Norwegian culture. In addition to language es, activities are available in Norwegian cooking, rosemaling, dancing, and more. Activities planned for 1998 at Masse Moro include a Norwegian juletrefest (Christmas celebration) and a fjord horse hayride. As with the district 3 camp, campers at Masse Moro return year after year. 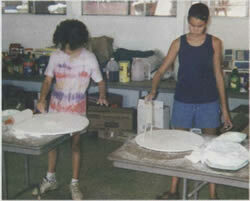 Campers learn how to make lefse, just one of the many activities available at Camp Norge in Alta, California. Indeed, at many of Sons of Norway's camps, participation is a family tradition. Parents say that younger children often can't wait until they, too, are old enough to attend. For the Beitels of British Columbia, camping has become a family affair. Mom Wenche, who immigrated from Norway at age 7, dad Terry, and kids Terik (14), Anders (11), and Katrina (9), all spent a week last summer at the Trollhaugen Family Camp in Alberta, Canada, which is in district 4. "My parents kept [the Norwegian] culture strong in our family," Wenche Beitel says. After her husband read about Trollhaugen in the October 1994 issue of Viking, they decided to give it a try. Accommodations at Trollhaugen vary-there are supervised cabins for teens, where Terik and Anders stayed. Wenche, Terry, and Katrina camped in their tent trailer. Overall, 157 peo-ple attended the camp last year, which celebrated its 25th anniversary. Campers at the week-long session included couples, teens, grandparents, and entire families. There were Norwegian lessons, ethnic cooking, rosemaling, Hardanger embroidery, knitting, and chip carving." Nine-year-old Katrina's favorite camp activity was sewing. 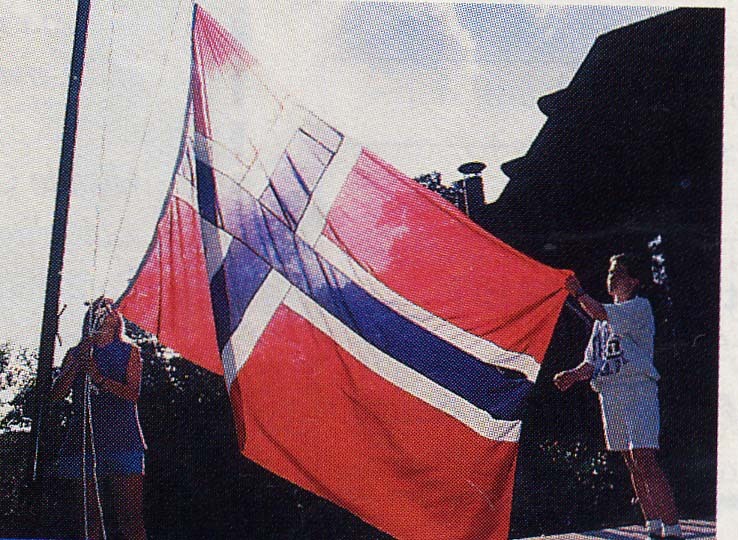 "We made a Norwegian flag, and did a design on a doll's apron, and made a heart," she recalls. Her second-favorite activity was cooking. "We made a pancake thingy but very big and round. You eat it with butter and cinnamon ... I remember, it's lefse!" Other favorite treats included krumkaker and kransekake. Wenche Beitel even enjoyed doing chores. "I wasn't sure I would like [the system]," she admits. "Everyone had to share chores. You were assigned tables and changed chores every day. But it built a sense of community and gave us ownership. Everyone worked together to make it the best camp it could be. "We're planning to go back and hoping my parents come with us," she concludes. Going on to Camp Norway in Skogn, Norway is a goal for many young campers (see related information on page 15). The month-long intensive language course gives participants ages 16 and up a semester of college credit as well as a chance to "make one-on-one contact with Norwegians," Gulhcks explains. The program rents school and dorm facilities; the area Sons of Norway lodge helps arrange contacts with local families. Hiking through the woods, joining together in a dance, or sitting around a campfire after a busy day-these are moments that form lasting bonds for people of all ages. Add the bonus of Norwegian language and culture and you truly will have masse moro!